India Women coach Maymol Rocky: Primarily focusing in improving the fitness levels! Punjab look to carry on Santosh Trophy legacy through coach Harjinder Singh! Hamburger SV fire coach Christian Titz, Hannes Wolf takes over! 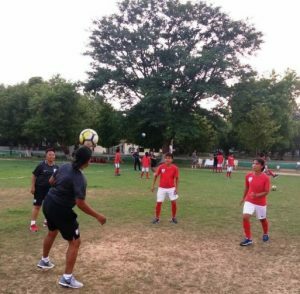 Home / Indian Football / Team India / India Women coach Maymol Rocky: Primarily focusing in improving the fitness levels! The Indian Senior Women’s Team is presently undergoing a selection camp in Gwalior till July 25 for the forthcoming Olympic Qualifiers which are slated for November 2018. In an interview, Head Coach Maymol Rocky spoke at length about the purpose of the camp, the training sessions, looking at more players and much more. Why do you call this a selection camp? We had earlier camped in Bengaluru anticipating participation for the Asian Games which the girls were very much looking up to. We had worked very hard in the Camp in Bengaluru but after the setback of the Team not being cleared, we felt best to continue the good work in another camp and look ahead. The Olympic Qualifiers are slated for November. Don’t you feel this camp has been summoned a bit too prior? Not at all. We believe in kicking-off proceedings much earlier so there’s no catch-up to be done at the 11th hour. By the time the girls come back for the Qualifiers, they would be mentally and physically prepared for the challenge. 2018 is a big year for Women’s Football in India as all the age-group teams and the Senior Team have tournaments and AFC Qualifiers slated in due course. What are you stressing in the Camp? We are primarily focussing on improving the fitness levels. It’s not just sessions alone but also making the girls aware of the importance of maintaining fitness all throughout. Will you also be looking at more players once this selection camp ends? It’s not that we have finalised on our selection. The girls will be given a break after this and if we find better players, we will definitely make them part of the team. That’s the basis essence of Football. Previous VIDEO – 442oons: 2018 FIFA World Cup – SF: France 1-0 Belgium (Parody)! Next Jamshedpur FC launches its own Grassroots Programme!